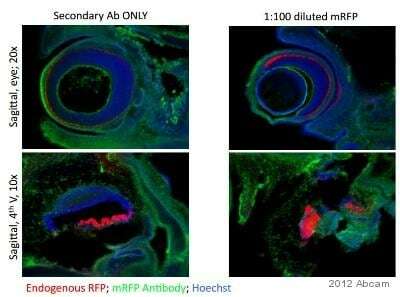 We have very few antibodies against RFP that are not raised in rabbit. Of these, the best candidate for having no reaction with GFP isab109809 as it is raised against the N-terminal region of the protein which has very poor homology with GFP. However, none of these products have been expressly tested agianst GFP. I hope that you find this information helpful. Please contact me should you have any questions. We are interested in testing ab109809 (mouse anti-RFP) in ICC and IHC. DISCOUNT CODE: **** Expiration date: May 12, 2012 I am very pleased to hear you would like to accept our offer and test ab109809 in ICC (immunocytochemistry). This code will give you one free primary antibody before the expiration date. To redeem this offer, please submit an Abreview for ICC and include this code in the “Additional Comments” section so we know the Abreview is for this promotion. (If you are not testing the antibody in ICC, on cell cultures, but in IHC on tissue sections instead, please let me know). For more information on how to submit an Abreview, please visit the site: www.abcam.com/Abreviews. We publish both positive and negative Abreviews on our datasheets so please submit the results of your tests regardles of the outcome. The code will be active once the Abreview has been submitted and can be redeemed in one of the following ways: 1) Call to place your order and mention the code to our customer service department; 2) Include the code in your fax order; 3) Place your order on the web and enter the promotional code. Any feedback that you can provide will be greatly appreciated, whether positive or negative. If you have any further questions, please do not hesitate to contact us. We look forward to receiving your Abreview and wish you luck with your research. The terms and conditions applicable to this offer can be found here: www.abcam.com/collaborationdiscount.